Connor joined our SEO team as a copywriter. An English Lit Grad and a MA in Creative Writing makes him ideal to create engaging content for our clients. Read all posts. On the 14th of July, one of the world’s most exciting and up-and-coming sports takes the centre stage in Welwyn Garden City, the Long Drive World Series (LDWS). The event invites the world’s heaviest hitters to take part in a competition which sees them pitched against each other for a cash prize. A total of 16 of the world’s best hitters will be taking part, including 4 wild cards that are sure to make a huge impact. As it stands this is set to be one of the UK’s biggest golfing events of the year. What makes the LDWS different to other golfing events is that it’s aimed at a newer, broader audience. The LDWS looks to move away from traditional golf events, opting for a more lively, atmospheric scene with live DJ’s, pyrotechnics and VIP areas. 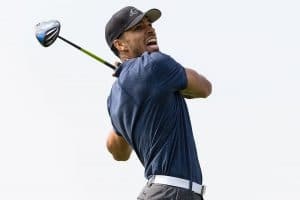 The aim of the game is simple, golfers who fancy themselves juggernauts of long drives travel to LDWS events to test their metal against other competitors. The winner is determined by whoever can smash the ball the furthest distance, simple! As with any massive competition, there will undoubtedly be some fiery personalities and bitter rivalries to electrify the event. Not only that, but add in some pyrotechnics, live DJs, VIP areas alongside food and drink areas, and you’ve got yourself a day packed with non-stop action. The event is open to the public from 12 (noon) starting with a round of 16 to kick off the day, with the main event beginning at 7pm. However, if you’ve grabbed yourself one of the wicked VIP tickets, you’re access begins at 5pm, you’ll be greeted with champagne and canapes upon arrival, and to cap it off, you will have unlimited access to food and selected drink! Bamboo Nine are Proud Sponsors! If you’re coming along to the UK’s biggest golf event this Saturday, be sure to look out for our banner on the course! The LDWS has already toured Dubai and Mexico, with England coming up next. Will Hogue is the current leader with a total of 28 points, closely followed by James Tait in second with 26 points. Dubai saw one of our own, James Tait take 1st place, scoring a total of 25 points, but stumbled in Mexico coming in at 12th place. Hopefully he’ll be able to replicate his Dubai form in England and overtake current winner Will Hogue. Some of the world’s biggest hitters are going to be there, so if you’re up for watching some pros smash some 400-yd screams, you’re in luck. If this star list isn’t enough to get you down, we don’t know what is! Get Yourself Down to 2018’s LDWS! If you haven’t already, get yourself down to the biggest golf event this summer! The LDWS is breaking the mould of golf events across the globe, and the UK event is set to be the biggest yet. So, get yourself down to Welwyn Garden City to watch some of the world’s pros battle it out for the longest drive record!